No, that’s not a trick question! The answer is, of course, soil. Whilst that is technically true, do you understand why? Well, as an avid gardener, this is where I think things get a whole lot more interesting. You see, plants need nutrients to grow to their full potential. Specifically, they need nitrogen, phosphorous, potassium and magnesium – you may vaguely remember this from a distant Biology lesson! In natural conditions, the soil is the only place for them to find these vital nutrients in abundance. The rain dissolves the nutrients into the soil and the plant is then able to absorb them through its roots. So plants need this soil to grow, right? Wrong. If the plant’s roots are able to get these nutrients from another source, well, they don’t need soil at all! It is the nutrients that the plant needs, not the actual soil itself (though they do need something to grow in for support!). This is where a hydroponic system can be of use – they allow your plants to be taken inside to a place where you can control every aspect of the growing cycle. You can set the light and temperature levels, and most importantly they allow the plant grower to artificially manipulate the amount of each vital mineral available to the plant, meaning soil isn’t even needed! By giving them more of the stuff they need, you will be promoting faster growth than you could ever achieve by using traditional methods. The result for you: bigger, better, healthier plants that produce a higher yield of vegetables! There are actually several different types of hydroponic systems, with this idea lying at the core of each and every design. But this is just a simple explanation of how a hydroponic system works. Continue reading around this website if you want to learn more! When I first started to learn about the ins and outs of hydroponics, I was overwhelmed. There was so much information out there, making it hard for me to find a solid base to get started. That’s why I created this resource for you. Here, you will find the meanings of the most common hydroponics terminology, as well as all the common components that make up a complete system. If I reference something elsewhere on this website that you don’t fully understand, check back to this section and you should find a complete explanation! The nutrient solution is probably the most important part of a hydroponic system. It might sound complex, but it’s actually just a fancy way of saying nutrients dissolved in water! The reason hydroponics gardening is so effective is because the plants are fed not just water, but water brimming with vital nutrients needed for optimal plant growth. You can purchase a soluble form of these nutrients (in different mixes, designed to support different plants) that you simply add to water in the required dosage and then introduce to your system. The nutrient solution is the term we use to describe water that has already had these nutrients added to it. The nutrient reservoir, often shortened to “reservoir”, is where the nutrient solution is kept before it is fed to the plants. It is usually an old fish tank, or a large plastic container, that can hold large quantities of water. It is important the nutrient reservoir is not made from anything metallic as this is likely to introduce harmful elements into the nutrient solution which can be quite damaging to your plants. 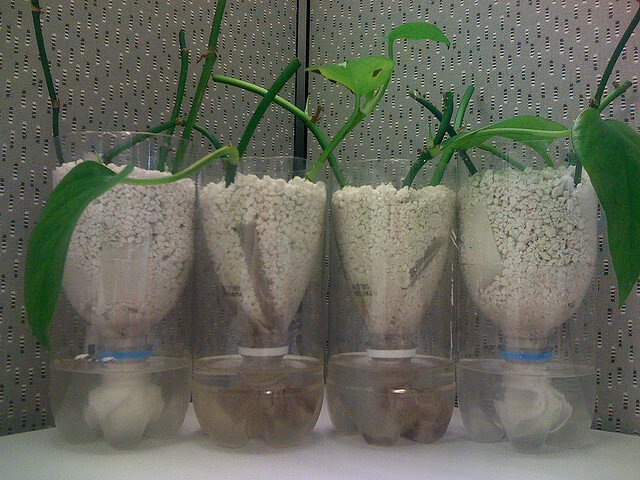 In most hydroponic systems you will find the plants kept separate from the nutrient reservoir. The plants are grown in what is known as a grow tray, or grow chamber. The majority of hydroponic systems keep the grow tray separate from the nutrient reservoir. Obviously, the plants need to access the nutrient solution, and it is the job of the delivery system to feed the plants. The delivery system is responsible for moving the nutrient solution from the nutrient reservoir to the grow tray and then draining the excess solution back into the reservoir. All hydroponic systems will feature a pump – often the same type that is found in an aquarium set-up. The pump is used to pump the water from the reservoir into the grow-tray, or simply to circulate the water in the reservoir to keep it oxygenated and discourage algae growth. An airstone is not an essential feature of a hydroponic system, but it is one that I would recommend. Have you ever looked into an aquarium and seen hundreds of bubbles being blown up from the bottom to the surface? Well, these are created by the airstone. An airstone is great for adding oxygen into the nutrient solution, which will promote faster growth rates in your plants. If there is no pump to circulate the solution and no airstone, well, there will be very little oxygen in the water. The airstone will solve this problem, as well as keeping the nutrient solution fresher. The growing medium is what the plant grows in. If you are putting plants in your garden, then you are most likely using soil as your growing medium. However, plants don’t need soil to grow, and there are plenty of other materials that can be used to support a plant’s weight and root system.